Part utility and part curb appeal; copper gutters offer a great way to enhance the look of your home or business while protecting it from water damage. Aside from their durability and longevity, copper gutters are also prized for the beautiful green patina color they develop with age. At Tradition Roofing and Exteriors, our aim is to provide affordable made-to-order copper gutter products. Copper gutters will last a homeowner’s lifetime so you can rest assured they won’t require frequent repairs and maintenance. 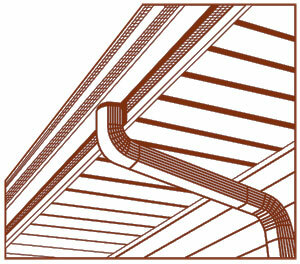 We offer a wide range of copper gutters and downspouts for any size or type of roof. Copper gutters add a classic look to your home, increase its resale value and protect it from water damage. Gutters are a necessity to divert the rain from your roof to avoid structure damage, damp walls and potential mold. Let our experienced staff assist you today. Please contact Tradition for more info. For a FREE, no obligation estimate. When we say no-obligation, we mean it. You won’t get a high-pressure sales pitch from us, just a clear and accurate estimate. CatsAway Graphic design managed WordPress site.